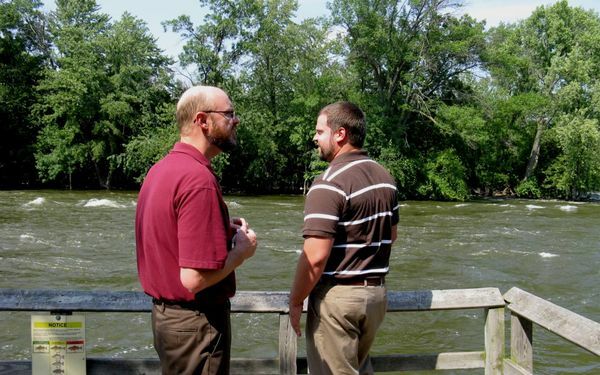 I attended a one-day conference last week for the ten or so communities in the state that received Energy Independence grants from the state of Wisconsin this year. Polk County — specifically, the renewable energy committee of which I am a member — won one of the grants. The conference was predictably interesting (and offered lengthy opportunities for knitting — more on that later). Even better, though, was the fact that the conference was being held in the home town of one of everyone's favorite knitters, Vicki knitorious! We met on the day of the conference, and she took me to her daughter's coffee shop for breakfast. filled with photographs and paintings by talented members of the owner's family. We sat in cozy chairs and drank coffee and ate bagels and cream cheese and knitted until it was time for me to scurry to the conference. Thanks, Vicki! It is always so good to get together with a fellow knitblogger. finny stuffed critters who surrounded us in the conference room. I chatted with this man, the city manager of a smallish city, before the conference started. Should I have told him to keep an eye on that fellow attendee over his shoulder? 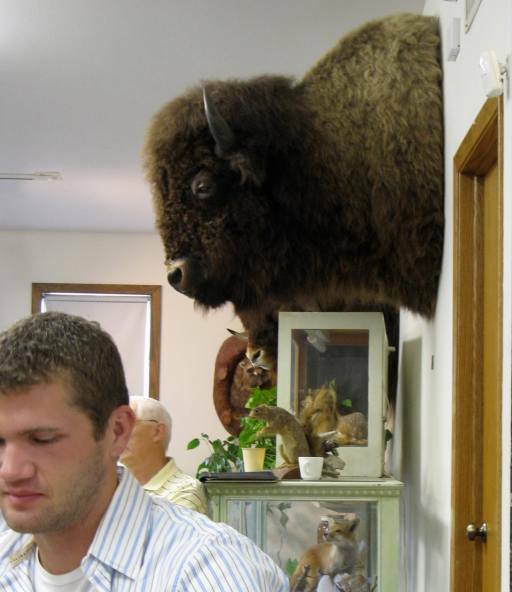 Is it just me, or is that buffalo give this guy the evil eye? They were checking out the river next to the nature center. 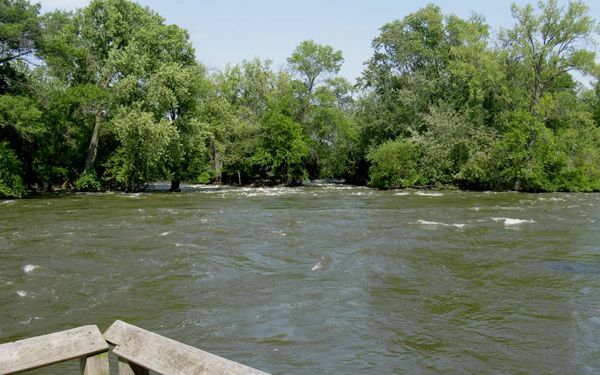 It was really rockin' and rollin' — lots of recent rain thereabouts. It was a five-hour drive from our government center to our motel. What to do to fill the time? This is for a benefit and silent auction next month. 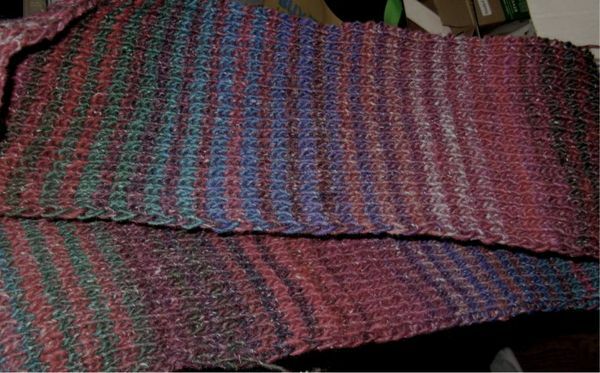 I cast on as we were leaving the government center parking lot Tuesday afternoon, and the scarf was 51" long by the time I got home Wednesday evening. Go, me! * Vicki told me later that she thought all the critters were donated by by a big game hunter who lived in town at one time — he lived right on the main drag and had big display windows toward the street to show them off. Probably better that they are where they are now. This entry was posted in Animals, Community knitting, Friends, knitting, Scarves. Bookmark the permalink. 0 Responses to Coffee, conference, and knitting. I think Typepad ate my first comment. I think it would be extremely uncomfortable to try to work with all those poor critters looming around me. 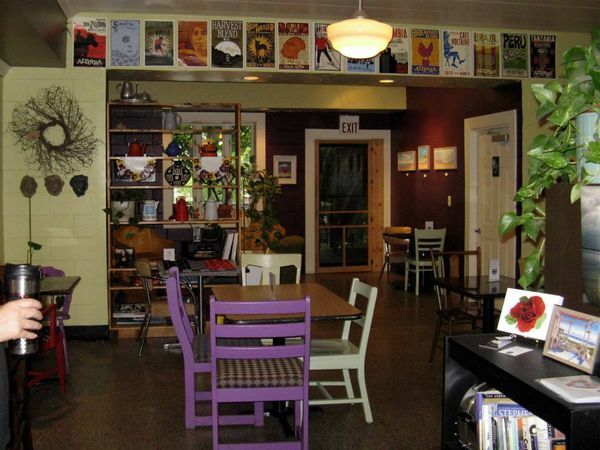 The coffee shop, however, looks delightful. Look at how high that water is!!! There is a bar in Hayward/Spooner area that puts little sparkle lights in the eyes of the dead critters on their wall. We always called it the Deadhead bar. The coffee shop looks wonderful! Whoa. And that’s beyond creepy. Oh so funny. I have to say, before I married a dude from Wisc., my little NJ self thought Kaukauna club cheese was Hawaiian. It sounds, kind of Hawaiian, doesn’t it? I have to laugh at Mary Lou’s comment… when I lived in Oregon — Tillamook, to be exact, which is another big cheese town — I worked for the local shopping guide and sometimes took ad copy over the phone. 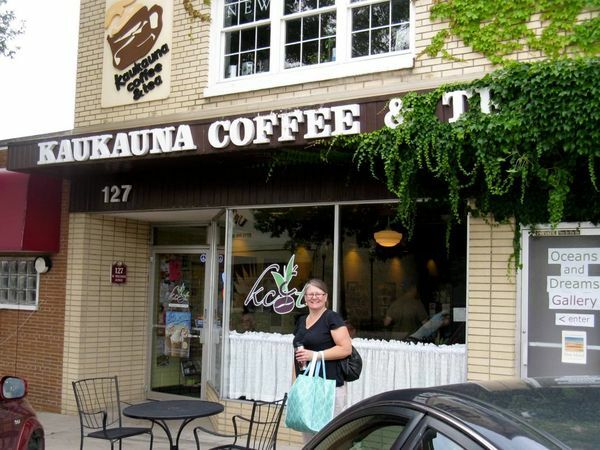 It was a market on the line one day and he was trying so hard, saying “ka-oo-ka-oo-na — must be Hawaiian…” and I told him, No, it’s Kaukauna Klub from Wisconsin and I used to live there, too! And, of course, now I do again. Oh, how homey! The little philodendron over by the stuffed squirrels… I can almost smell the room. You are brave. 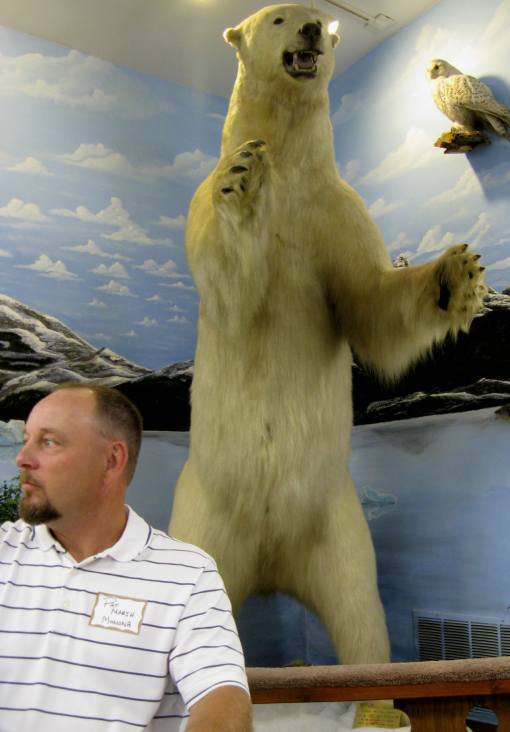 I just looked back, and in that first picture of the conference room the polar bear is trying to steal that guy’s coffee. Or hand. I’m with you in thinking the taxidermy is odd in a nature center. Taxidermy is creepy anywhere, but somehow particularly so there because it injects chemicals and a certain preciousness into a place that is intended to be about, er, the natural. Taxidermied animals have always made me nervous. Can’t get over a feeling that maybe they’re just pretending… I wouldn’t have been able to pay attention to the conference, since I would have been constantly checking to make sure critters weren’t sneaking up on me. Taxidermy is just disturbing. I don’t know how you could concentrate. What a fun day – well, except for the driving maybe and even then you got to knit! 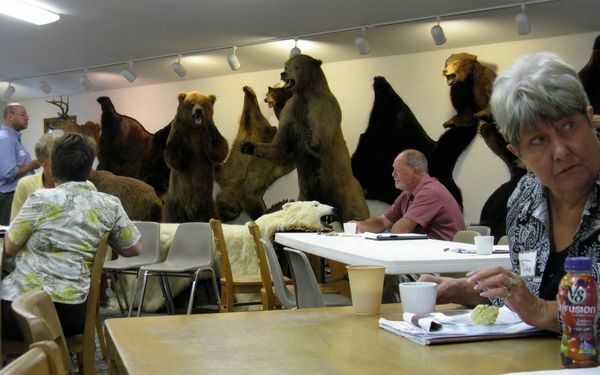 I’m with the other folk — too many taxidermed critters for comfort. It’s an awesome art, but …. shudder..